Alison Thewliss, SNP candidate for Glasgow Central has officially launched Festival Fortnight 2017. Executive Director Hugh Torrance gave an outline of the charity’s national and international work and discussed areas of importance in working towards greater inclusion of LGBTI people in sport, and in combating discrimination in sport. 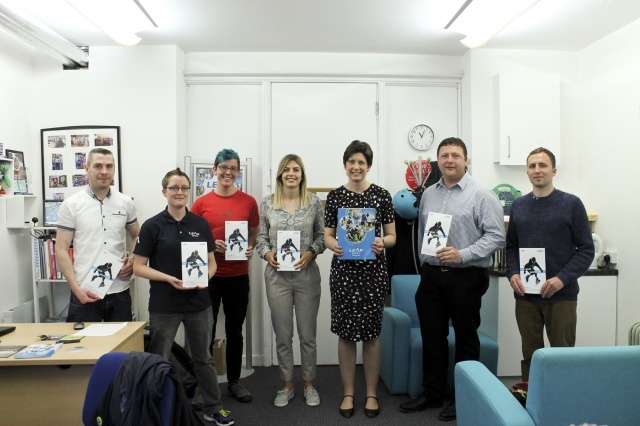 Alison met with volunteers, staff members and LGBTI sports group representatives to talk about key equality issues within sport and to overview some of the highlights of this year’s festival programme . This year’s Festival Fortnight has grown to include 57 sports, cultural, academic and recreational events and activities in many communities across Scotland. This years Festival is bigger than ever, and reaches more communities than ever, giving a platform for not only participation in sport, but for celebration, visibility and engagement in sport for our diversely identifying community members. You can click here for a PDF brochure or to search this year's events online. Written on 12th May 2017.